The original image is from my collection of vintage chicken photographs and dates from the first decade of the 20th century. 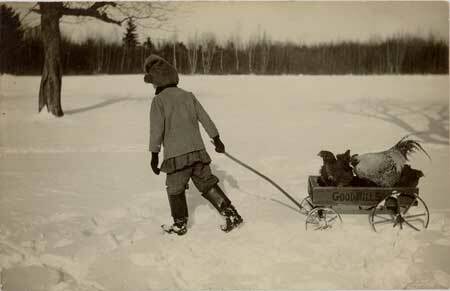 This snapshot of a boy pulling a wagon with three chickens captures the spirit of the winter season. Take a look at the details – the tassel on the boy’s hat, the wagon made from a soap box, and the rooster happily going for a ride with two hens. It’s an image that is sure to make everyone who sees it, smile.